Dr. Pai’s message states says that although what you eat may not cause cancer, what you eat can determine whether or not your body will support the growth of cancer. How you handle stress has a direct effect on your body’s healing response. By eating a non-inflammatory diet, you can heal many illnesses and sustain your health through. Dr. Sunil Pai is an unusual man. Sunil Pai, M.D., is a physician, a Medical Doctor, Board Certified in Holistic Integrative Medicine. 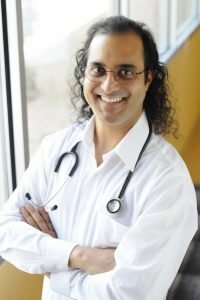 He did a residency in Family Medicine, is a fellow of the Program in Integrative Medicine at the University of Arizona (Class 2002) directed by Dr. Andrew Weil, has been certified by Dr. Deepak Chopra as a Primordial Sound Meditation Instructor and a Creating Health (Ayurveda Lifestyle) Instructor. That’s in addition to his being certified in Functional Medicine, Physiological Regulating Medicine, Medical Acupuncture and Scalp Acupuncture through Stanford University School of Medicine. And he says we now have experimental proof and a biological understanding of why sustaining your health through a non-inflammatory diet is important. His new book, Inflammation Nation, is fully annotated with valid scientific studies that support his claims. For instance, the studies on tumor cells growing in the laboratory that showed that when they were exposed to casein, the chief protein molecule in milk, the cells grew ten times faster, and when it is removed, the tumors gradually slow their growth. 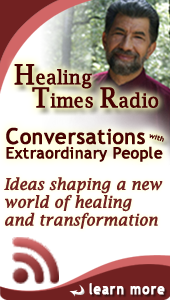 In this show we will focus on the process of inflammation, how it can help us, and how it can harm us. Inflammation is at the base of illnesses from colitis, to heart disease, from arthritis to pink eye. You will learn how choosing the right foods can balance the inflammatory reactions in your body, and why it makes good sense to choose anti-inflammatory supplements. Learn more about Dr. Sunil Pai at sanjevani.net . And it all makes sense! Don’t miss this episode. CD/mp3 Download – There is a reason this is the best loved and most popular CD for melting away stress from your body and your mind. 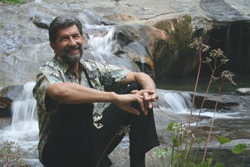 You will notice it as soon as you listen – the soothing voice, the caress of the waves, the music of Stephen Halpern, Ph.D. – four different guided imagery experiences offering four different techniques for melting away stress and harnessing it’s energy for healing and peak performance. Buy it now. 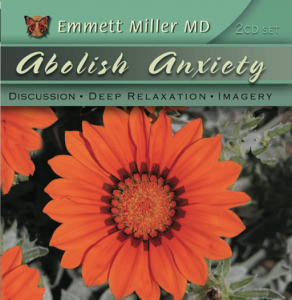 CD/mp3 Download – Anxiety may be present as fear, it may inflame the emotions, or it may show up as muscle tension or pain as in fibromyalgia. It can cause obsession and worry and even depression. And all of these produce inflammation. 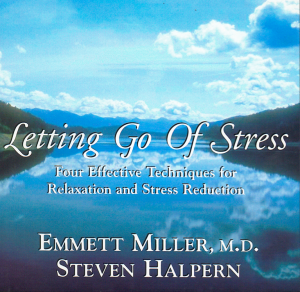 This CD will help you understand what anxiety really is and provide you with an effective tool for neutralizing and balancing out any anxiety you have. Buy it now. 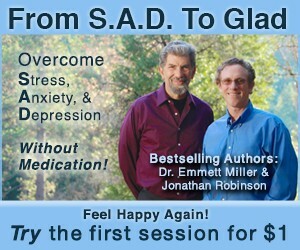 This program will show you that there is a spectrum – from Very Extremely Happy all the way down to Miserably Depressed and Hopeless – and that there are a wide variety of tools you can use, no matter where you are on this spectrum, to move towards the Happiness end of the scale and away from states of sadness, anxiety and stress. There is even a log, so you can scientifically discover which of these many tools will work for you. Buy it now. You will discover that how you think, what you eat, and how you visualize yourself and your world can all be changed through the techniques you learn here. And as you change them you also reduce the level of inflammation and set yourself up for vigorous good health.